Cummings Veterinary Medicine | Got Microbes? 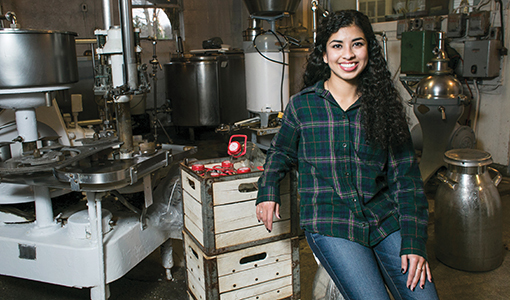 Meera Sriram, V16, a Cummings School student who’s also pursuing a master’s of public health at Tufts School of Medicine, spent the summer studying the safety of raw milk. She found a little-known food-borne bacterium present in a large percentage of unpasteurized milk samples taken from dairies across southern New England. Although farm-management practices appear to affect the odds of its transmission, Sriram says the findings support public health efforts to universally discourage the consumption of raw milk. Although most people in the United States buy pasteurized milk, the Centers for Disease Control and Prevention estimates that 3 percent of the population, or some 9 million people, choose to consume raw milk. Fans of raw milk argue that the high-heat process used during pasteurization to kill germs that cause salmonellosis and other infectious diseases also destroys many of milk’s nutritional benefits. Federal experts disagree. There’s also more profit in raw milk—small dairy farms that sell it directly to consumers can charge from $6 to $20 a gallon. Unpasteurized milk is a public health concern because it can transmit tuberculosis and other diseases from livestock to people. Recent studies indicate that “the bacterium is likely endemic in the United States,” Sriram says. A 2005 study at Cornell University found C. burnetii in 94 percent of unpasteurized milk samples taken from dairies around the country; a follow-up study in 2007 by the U.S. Department of Agriculture found the bacterium in 77 percent of raw milk samples, she says. Working with her faculty mentor, Kevin Lindell, an assistant professor of environmental and population health at Cummings School, Sriram spent three months collecting 30-milliliter samples of unpasteurized milk from 78 raw milk and commercial dairies in Connecticut, Massachusetts and Rhode Island. Sriram also administered an anonymous survey to all the farmers to gain insight about the potential for disease transmission and farmers’ own raw- milk consumption. The survey asked about herd size and the dairy facilities’ age, type of ventilation, milking protocols and bedding and housing of cows.